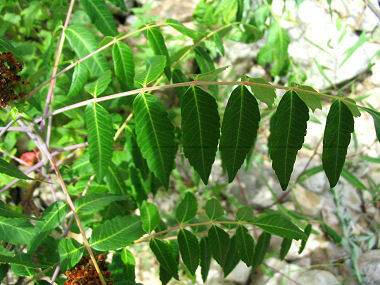 Smooth Sumac is a member of the Cashew or Sumac Family. The plant appears as a shrub or small tree and grows to 20 feet in height and has shiny, green, leaves with toothed edges that grow in pairs on either side of the branches to 4 inches in length each. The plant typically grows along roads and in pine forests at elevations between 5000 - 7000 feet. 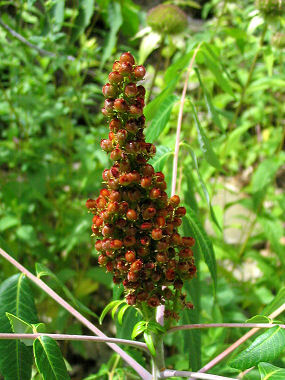 Birds and other wildlife feed on the fruit of the Smooth Sumac (seen at right). Smooth Sumac blooms between June - August and produces a cluster of white flowers with 5 petals that grow in an 8 inch long spike-like cluster. The flowers are followed by dark red, round fruit that are covered with short, sticky red hairs.